The Disney Channel and its stars are uniting with the goal of inspiring millions of kids and families to make a difference in their community. Disney Channel Stars Debby Ryan (“Jessie”), Bella Thorne and Zendaya (“Shake It Up”), and Ross Lynch and Laura Marano (“Austin & Ally”) will serve as the inaugural ambassadors for the Friends for Change initiative. The winter holidays are typically the toughest times for food banks and this year the demand is higher than ever. So it’s great to see Walt Disney World and its cast step up to make a big donation and a pledge of continued support to one of the great food banks here in Central Florida. 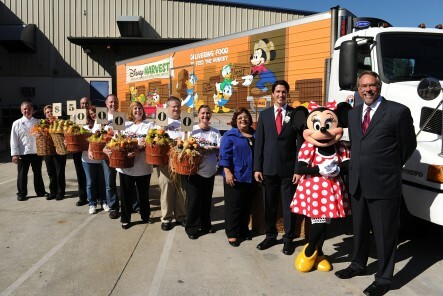 Yesterday, Minnie Mouse joined Disney VoluntEARS to deliver bushels of green to Second Harvest Food Bank of Central Florida in the form of a $500,000 gift for the organization’s expansion. Disney also pledged 20,000 pounds of fresh produce during the next year as part of the commitment. The gift was part of Disney’s efforts to support organizations and programs that make a positive impact on children in the local community and will fund Second Harvest’s “Building Solutions to Hunger” capital campaign. The cash contribution will help the organization build a larger facility so it can accept and distribute significantly more food and reach more Central Floridians in need. The Walt Disney Company has had a presence in Japan almost 30 years and the animation products produced by Walt Disney have a huge following in Japan. 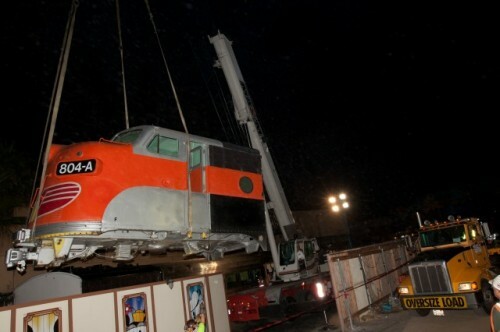 So to say there is a lot of goodwill between the Disney legacy and the people of Japan is an understatement. It’s terrific to see the Disney company and its employees reach out to make a sizable donation to help the people of Japan in their time of emergency. According the press release below, The Walt Disney Company and its employees will send as much as $1.5 million to the relief effort. $2.5 in an initial donation to the American Red Cross and up to another $1 million in employee donations and matching funds to the Red Cross and Save the Children. That’s a pretty sizable sum and a great gesture from Disney. Additionally Disney has reached out to both US and international employees in Tokyo with help and the OLC will provide those international cast who desire it a round-trip ticket home and then back to Tokyo when the park opens again. Custom ‘Rides’ are assembled by RideMakerz store staff. 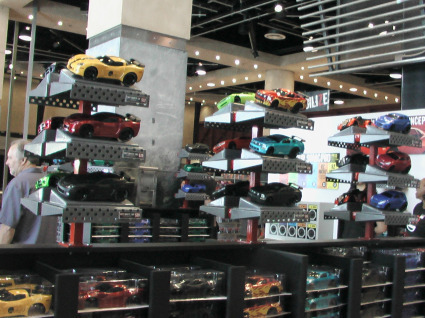 A new store has popped-up for a limited engagement in Downtown Disney Westside at Walt Disney World that aims to make model remote control cars as customizable and fun as build-a-bears — Ridemakerz. Not a coincidence since the same company is an owner of both store concepts. A Ridemakerz shop has been open in Downtown Disney in Anaheim, since 2009 and is looking to expand its offerings there. 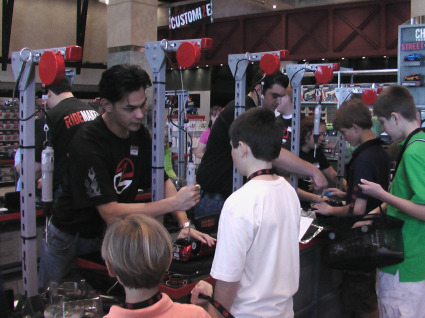 The Ridemakerz experience invites guests into the ultimate car customizing shop where they can build a one-of-a-kind radio control car or “RIDE”. Between bodystyles and colors, tires and wheels, lights and sounds, accessories and decals, Ridemakerz estimates there are more than 649 million possible build combinations, not including individual decal placement. 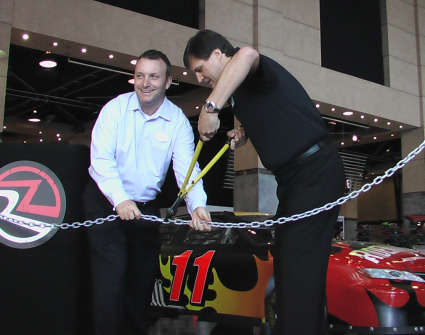 “Ridemakerz delivers a high-octane experience and one-of-a kind fun,” said Downtown Disney Vice President Keith Bradford. 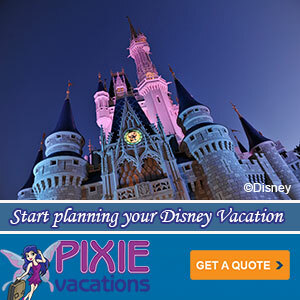 “We’re excited to add Ridemakerz to our existing portfolio of unique offerings at Downtown Disney. It fills a niche our guest’s have been looking for. The store occupies the old Virgin Record Mega-Store location, which has become something of a showcase location for temporary exhibits. The space isn’t really made for that sort of role. So eventually they’ll have to totally remodel this location for a new long-term tenant. But in the meantime, this is a better use than to just let it sit empty. The good thing about occupying the huge space is that they can add something of a mini-auto show for full size cars. Eight world-class show cars are on display, including a Chevrolet C5.R racecar built by Pratt & Miller Engineering for General Motors. 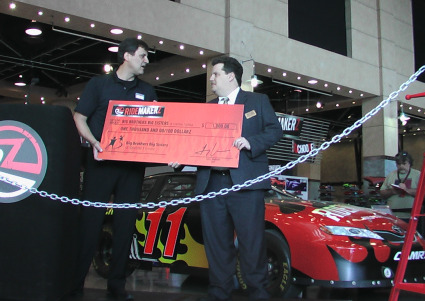 The display also features an F150 NASCAR Pace Truck and Dodge Ram from the personal collection of legendary car customizer Chip Foose, as well as a MINI Cooper from the private collection of famed movie car designer Fireball Tim Lawrence. 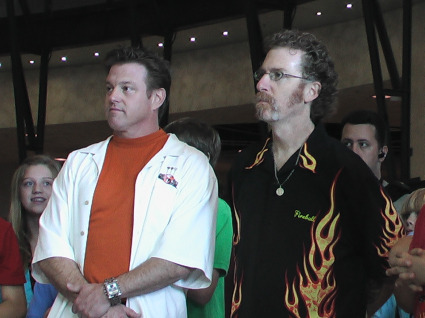 Chip Foose (l) and Fireball Tim Lawrence were at the event and later suggested designs for the cars and signed autographs, a nice touch. “The Ridemakerz brand and this shop, in particular, are close to my heart,” said Foose during an autograph session at the grand opening on March 25th. “I learned about car customizing from my Dad, and now I get to help pass that experience on to fathers, sons and families across America.” Foose also serves as an advisor to Ridemakerz. “The Ridemakerz experience is pure fun, and the process is designed to spark creativity, encourage collaboration and build confidence,” says Ridemakerz ZEO (CEO) Larry Andreini. A sample of some available ‘Ridez’ styles. In a nod to real-world car culture, Ridemakerz has agreements with several automotive manufacturers to offer versions of today’s most popular cars in its line-up. Guests, or “Customizers” can choose from the Ford Mustang and F-250 Super Chief Alternative Fuel Concept Truck, Chevrolet Corvette C6.R and C6RS, Dodge Ram, Challenger, and Viper, MINI Cooper S, and Scion xB. Retro hot rods, fire engines, racecars, cab-over tow and dump trucks, and many more favorites are also available. 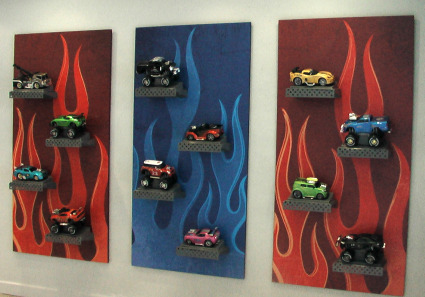 Complete RIDEZ range in price from $10 to $32, depending on body and paint style chosen. Radio remote control can be added for an additional $25, and custom accessories range in price from $2 for grill guards, spoilers and hoods scoops to $15 for themed kits that include a wide range of complementary accessories. RIDEZ measure approximately 12 inches long, or 1:18 scale, and are easy to assemble with snap-in, snap-on components that do not require glue. I had quite a bit of fun with testing out the remote control cars for myself. The controller provides a decent amount of control for the price and the cars are very durable. Of course, this was indoors, your mileage may vary on surface streets. The prices are very affordable considering what you get. The question for visitors will be how to get their custom Ridez home.